IT sector is one of rapidly growing sectors today. 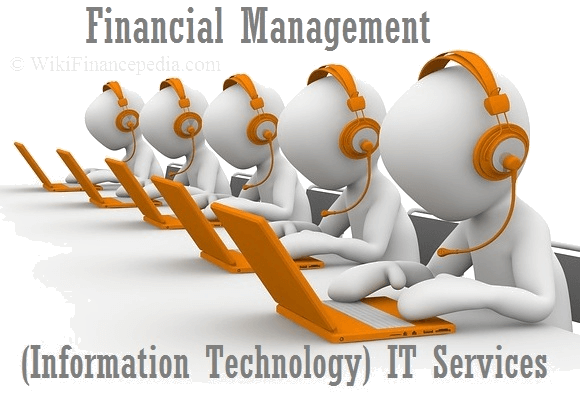 Wikipedia defines Financial Management for IT Services as, “Service Delivery element of the ITIL best practice framework. Aim of this ITIL process area is to give accurate and cost effective stewardship of IT assets and resources used in providing IT Services. It is used to control, plan and recover costs expended in providing the IT Services negotiated and agreed to in a service-level agreement (SLA).” The discipline of finance management in IT sector has shown some progress recently. Financial Management for IT Services aims to enhance the cost of IT Services and minimize risks involved without compromising with the quality. Excellent and metric based strategies are optimized after analyzing the cost against quality and risk. IT services can’t always rely on cost cutting to deliver optimum consumer outputs, therefore balancing of cost is considered. Based on principles of standard financial and accounting Financial Management for IT Services includes specific principles like fixed asset management, capital management, audit, and depreciation, these principles are applicable to IT services. Providing cost-effective stewardship of the IT assets and resources is described as goal for an internal IT organization. For an outsourced IT organization ability to entirely being liable for the expenditure on IT services and the ability to meet these costs and attribute them to the services delivered to the customers by providing detailed business cases for proposed changes to IT services is the primary goal. Outsourced IT organization acts as a separate entity and therefore it is accountable for its cost expenditure. Planning future IT expenditures, minimizing the risk of over-spending and ensuring the revenue generation is called Budgeting. Comparing actual costs with the predicted one is one of the features of budgeting. This enhances the reliability of budgeting predictions. Basically, budgeting involves purchasing and managing the required inventories at minimum cost to generate maximum profit. IT accounting deals with various financial accounting required to offer optimal IT services. Financial analyses are conducted within the organization to determine the efficiency of the IT service. It also accounts for regulating those financial arenas where capital cost can be reduced. Capital costs – Purchases that might have a residual value, such as hardware and building infrastructure. Operational costs – Rental fees, monthly electrical invoices, salaries and other day to day expenses. Direct costs – Any specific service or customer might need special attention, the cost directly attributed to it is called direct cost. Fixed costs – Annual maintenance contracts, maintenance of fixed assets or a lease contracts. Variable Costs – Any expenses that vary in the short-term based on the level of services provided, resources consumed, or other factors. For example, energy costs are variable based on the amount consumed. The process of allocating fair and proportional costs to the users of IT services is known as charging. It requires heavy investment and resources. Charging sometimes is the first stage of financial management of IT Services. Service Level Management: It is an agreement that provides information regarding the service level to be provided by IT services to the customers. After evaluating various calculation and customer needs, SLA (Service Level Agreement) is been prepared which disclose charges to be paid for services agreed upon. Capacity Management: It is a process followed during planning phase of IT organization. This disclose capacity requirement, changes in cost, purchasing of new technologies, capacity required during emergency, scale of economy, etc. Change Management: It plays a crucial role in financial management for IT services. It indicates change in process, frequency of changes, etc. It is noted that if changes are frequent then capital invested may find hard time to gain profits. Just providing services to IT does not mean that you are running a successful business. Financial management for IT services plays a crucial role in building a great trust and great value with their customers and clients.